A Silicon Valley Boutique Hotel Sync up with Avatar Hotel, the perfect portal to the vibrant technology hub of Silicon Valley. Our Santa Clara boutique hotel will keep you connected, rested, and comfortable throughout your stay. 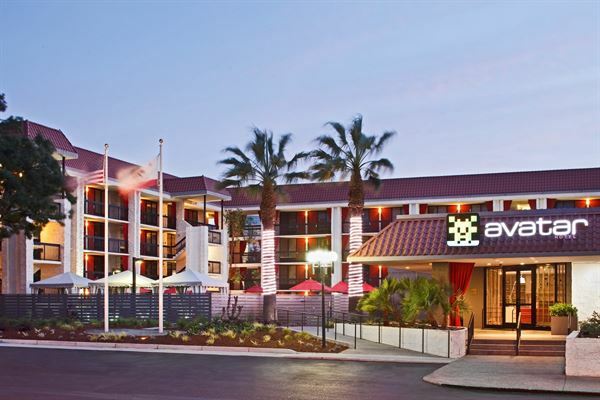 Enjoy being near many popular destinations, including the SJC Airport, Great America, Levi’s Stadium, the Santa Clara Convention Center, and more. Embrace your inner tech nerd. Our interactive business lounge features various sitting areas and flat-screen TVs for work play. It's the perfect event venue for breakout sessions or an ideal spot to use as an informal meeting room with clients. Special Features: All furniture is remove able to create the setup of your choice. Our executive meeting and conference room is a flexible meeting space with boardroom, banquet, classroom, and reception room layouts. The venue is ideal for team-building events, executive meetings, and intimate receptions. Vibrant Colors and entertainment for all and outside reception would be great within this space. The Pool Deck can accommodate Cocktail tables with an outdoor bar for day or night entertainment. The Loft Bar and Bistro has it all for lunch and dinner from appetizers, salads, sandwiches to outstanding steak and seafood.Owner Kam Razavi who brought you Capers Eat Drink Campbell, invites you to enjoy top notch cuisine along with romantic roof top patio dining in downtown San Jose. Serving Classic American dishes with a twist such as pork chops with papaya-jicama salsa and our signature meatloaf in wild mushroom demi-glaze, locals will appreciate the exotic flavors for a unique dining experience. Not only will they be amazed at our food options, but they can unwind from a busy day with our selection of fine wine and cocktails, as well as our live, weekly entertainment. Loft Bar and Bistro is a great choice for corporate banquets offsite catering or romantic private parties offering a tasty, buffet menu. Check our website for a video tour or come in today! The Four Points by Sheraton San Jose Airport has 195 guest rooms with 10 suites and 6 meeting rooms plus restaurant, lounge, and outdoor space totaling over 8,000 sq. ft. of interior space and 3,000 sq. ft. of outside function space. Our restaurant, Hangar offers American Fusion cuisine and our Bar/Lounge has Happy Hour every day from 4pm to 7pm with drinks, appetizers specials, and Live Music on Selected Nights! We offer free parking, Wi-Fi, superior customer service and great pricing for our guest rooms blocks and event packages! Contact us now to help plan and coordinate your event. Looking forward to hearing from you soon! Great America Pavilion, an 18,000 sq. ft. multi-purpose facility, located adjacent to Levi’s Stadium, is the Bay Area’s newest and most unique entertainment venue. Great America Pavilion is ideal for corporate meetings and catered events, holiday parties and product launches. The Pavilion can be utilized as a single facility, or be divided into three distinct areas, and includes a floor to ceiling stone fireplace, wood floors throughout, complete audio and visual capabilities, and high-end catering amenities. No group gathering is complete without tasty food and refreshing beverages. Through our corporate event catering services at Great America Pavilion, we offer menu options that include steak and lobster combinations, a wide array of salad selections, turkey and prime rib carving stations, a multitude of pasta and dessert bars and so much more. The DoubleTree is the perfect location for your event! We have 4 banquet spaces, including our beautiful outdoor Garden Terrace with bistro lighting. Your event includes no hassle planning, a dedicated staff, tables and chairs in any set up you would like, and on site catering! The Palms restaurant offers private and semi-private dining options for all types of events from boardroom meetings, graduations, birthdays to anniversaries, showers and rehearsal dinners. Our rooms are equipped with audio/video capabilities and controlled lighting for presentations. For events ranging from 10 to 150 seated guests, The Palms restaurant offers five unique locations personally tailored to your event requirements. Our attentive staff will see to your every need to provide you with an experience that exceeds your expectations. If you are looking to host an event look no further. We have the capacity to host for groups of size upto 100 and have a customized menu to suit your tastes. We have a team of creative event managers who can help you with ideas to make your party unique and a rich experience. Come and make memories celebrating your special occasions or host corporate events.